We at The Angel’s Ashes conduct elegant and intimate burial services for homeless vets. We understand that everyone has specific requirements and so offer all types of services depending on the religion you follow. While we recommend you opt for Long Beach Harbor for the burial-at-sea, we also offer these services at Newport, Catalina Island and San Pedro. We believe that every homeless veteran deserves an honorable and dignified burial. It’s why we have very specialized burial service programs for ex-military personnel that covers every aspect of the burial such as preparation of the body, the clothing and transportation as well as the casket and coordinating the funeral service. The scattering of the person’s ashes at sea is a very touching and wonderful tribute for your loved one. In some cases, this is specifically mentioned in the veteran’s will, because of their attachment to the ocean. In some cases, the family members feel this would be a wonderful way to give their loved one a fitting farewell. The service will be professional and customized to your needs (within legal limits). In case of a burial service for Military veteran, we will help with all the arrangements for the full Honor Guard Ceremony. Food and drinks for the memorial luncheon/gathering before or after scattering of the ashes at sea. We are committed to providing you the best services and make sure that you get value for money when you hire our expert services. If you are looking to reduce the expense even further, you can opt for services like Live Broadcasts of the ceremony and View-From-The-pier. These are a good way to keep a handle on costs, without compromising on the quality of the ceremony. The Angel’s Ashes’ services are not just for the military, they are for everyone. 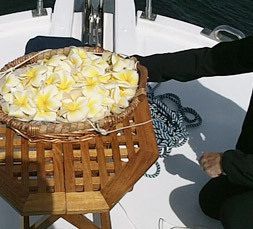 As non-profit organization, you find that our burial at sea cost is very affordable. For more information about our services and for any other queries you may have, please feel free to call us at this number- 714-393-9999, and we will answer even in the early evenings and weekends. You can also send us your queries via this email address or Contact Us form.